After winning the National Finals in Chennai, Akshay Gupta - an automobile engineering student from India - went to Silverstone , UK to compete against other Asian countries finalists fora spot in the Nissan Racing Driver Development programme and a seat in the 2016 Dubai 24 Hours Race. 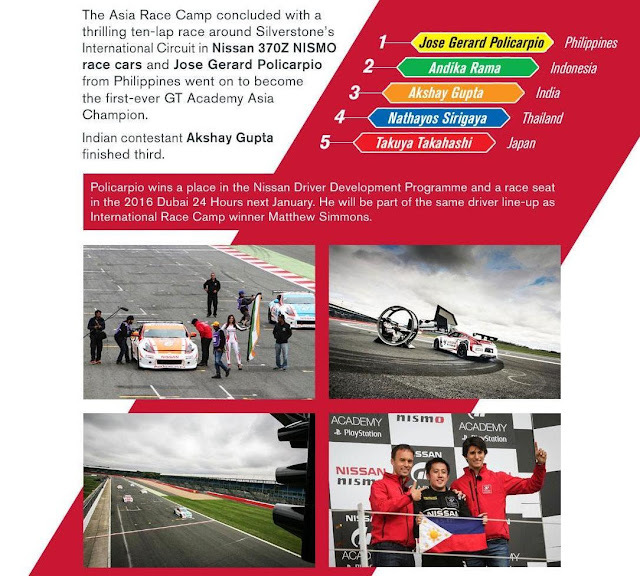 In the just concluded Finals at the Silverstone Race Camp for Asia, Akshay Gupta finished at 3rd spot behind Indonesia's Andika Rama and the winner Jose Gerard Policarpio of Philippines. The Asia Race Camp concluded with a thrilling 10-lap race around the Silverstone International Circuit between 5 finalists from 5 different Asian countries - Japan (Takuya Takahashi), Thailand (Nathayos Sirigaya), India (Akshay Gupta), Indonesia (Andika Rama) and Philippines (Jose Gerard Policarpio). All the 5 competitors were given a race-track optimized Nissan 370Z NISMO cars for the final race. Policarpio then made his move on the fifth lap to incisively take the lead of the race. Unfortunately the fifth lap proved to be the end of Takahashi’s race as he limped into the pits with a mechanical problem. This left Policarpio and Rama to fight it out unchallenged at the front, with the pair once again staying in very close proximity. The drama was saved for the last lap however with Policarpio getting a very slow exit out of Club corner, this left Rama right on his tail and after following him closely through Stowe, was poised to make a move into the final corner. Rama went for the move but some impressive defensive driving from Policarpio meant he held on and crossed the line just two-tenths clear of his rival. Policarpio earned his place at Race Camp from the hundreds of thousands of Gran Turismo gamers that entered the competition across Asia. Having won through the Philippines National Final, he arrived at Silverstone as one of six to represent the Philippines, alongside 28 Asia competitors overall, split into five territory groups. Each group formed a close bond with their territory judge, who acted as a mentor, but then had to make the difficult decisions when it came to eliminations from the competition. The on-track action got underway in the United Kingdom on Saturday, with six finalists from Thailand, Japan, Philippines, Indonesia and five from India making up the 29-strong line-up. For Japan, Philippines and Indonesia, this was the first year that a GT Academy competition had been run in their territory, with both Thailand and India debuting as part of GT Academy International in 2014. While Mexico’s Ricardo Sanchez was the 2014 winner, the opportunity provided a springboard for the racing careers of territory winners Thanaroj Thanasitnitiket (Thailand) and Abhinay Bikkani (India) who have both picked up wins in this year’s Nissan Micra Cup, based in Canada. Throughout their time at Asia Race Camp, a series of both racing and physical challenges whittled the gamers down to a final ten this morning that were still in contention of being GT Academy Asia champion. Each judge then had to decide between their two best drivers for who would take the wheel of the 370Z NISMO race cars for a ten-lap race of Silverstone’s International Circuit. The challenges came thick and fast throughout their week at Race Camp, with gamers being thrown into the action straight away on their first day where they got behind the wheel of single seaters, Caterham racers, Nissan GT-Rs and JPLM cars at Bedford Autodrome. Throughout the week, various surprise challenges were thrown at them including the ‘GT Ninja’ assault course, an innovative army-style Gymkhana driving race, dune buggy racing, head-to-head timed shootouts on the Silverstone track and an incredibly eventful Nissan Micra stock car race which saw only two cars finish which decided the starting grid for today’s final race.